All martingale collars are adjustable and slip over your pets head to put on. The front loop has a D ring that the leash fastens to when taking your dog out for a walk. The loop pulls the collar tighter around your dogs neck as he or she pulls while walking allowing for better control of pulling. An extra D ring has been added to the main collar section so that the collar can be turned into a regular collar when walking on a leash if you do not worry that your dog will pull on the walk. Please contact me if you prefer a regular collar made from these fabrics. A matching 5 ft leash can be purchased in addition in the options when ordering. 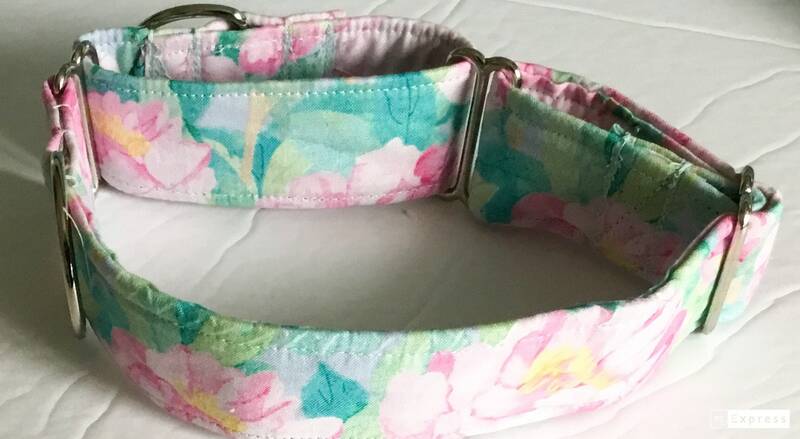 All martingale dog collars are custom made and are available in any fabric in my shop. I can also custom make a collar of a fabric of your choosing if you do not find what you are looking for in my shop. Please contact me via email in regards to this. Martingale collars are available in width sizes of 3/8 inches, 5/8 inches, 3/4 inches, or 1 inch. S - Fits neck sizes 12"- 15"
M- Fits necks sizes 14"-18"
LG- Fits necks sizes 17"-24"
XL- Fits neck sizes 20"-29"